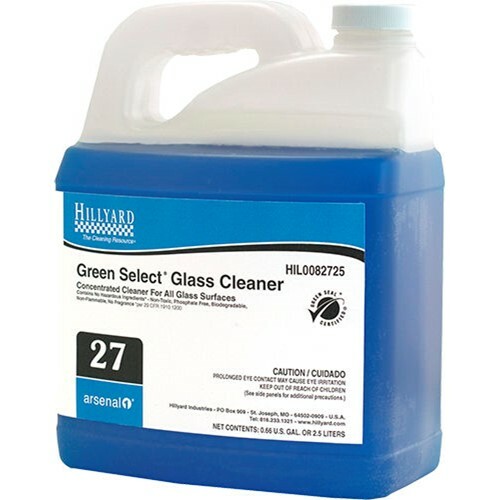 Home → Chemicals → Hillyard, Arsenal One, Green Select Glass Cleaner #27, Dilution Control, HIL0082725, Four 2.5 liter bottles per case, sold as One 2.5 liter bottle. Green Select Glass Cleaner will clean windows, TV Screens, porcelain, plastic, counter tops, restroom fixtures, and stainless steel. Works well as an all-purpose spray and wipe for any surface not harmed by water. Formulated to be effective with cold water, contains no phosphates and is biodegradable which means it has a lower impact on the environment. Contains no hazardous ingredients. Concentrated for economical cost-in-use. Green Seal certified. Dilution rate 6 oz per gallon.